Zombie Apocalypse edition of our Combat Machete w/ Offset Edge with bright green cord wrapping. This machete is overloaded with tactical considerations. An offset edge which puts more steel at the top of the blade. Similar to the design of a Kukri, this offset results in more cutting power and a better follow though by increasing the front blade weight. Optional two handed use. Nylon cord wrapping is secured around the base of the blade, allowing for two handed use when needed. Saw back. The blade's spine is lined with serrated teeth for sawing through thicker brush and other targets when chopping is not appropriate. Useful for shelter building when you need to saw small branches and other structure supports. A combo line cutter and wire stripper is built into the top of the blade. Full tang construction. The blade is crafted using one-piece of stainless steel, which extends to the bottom of the handle and is secured with dual steel pegs. Hardwood handle scales offer a firm grip while helping to absorb the shock from cutting impacts. 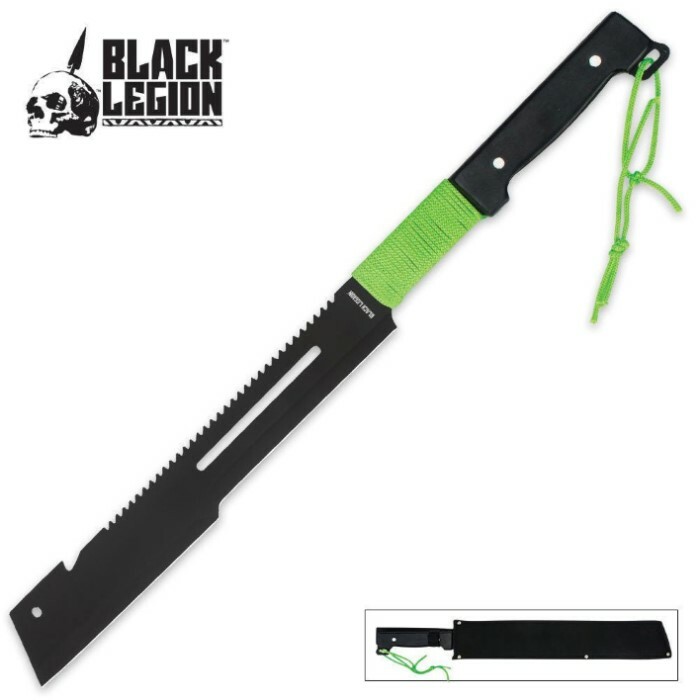 Most machetes come with a rounded tip, however this model features a sharp, well defined tip. This gives you the ability to make more exact cuts when needed, and has better self defense ability. Includes black nylon sheath with belt loop. Measures 22 3/4 in. overall.